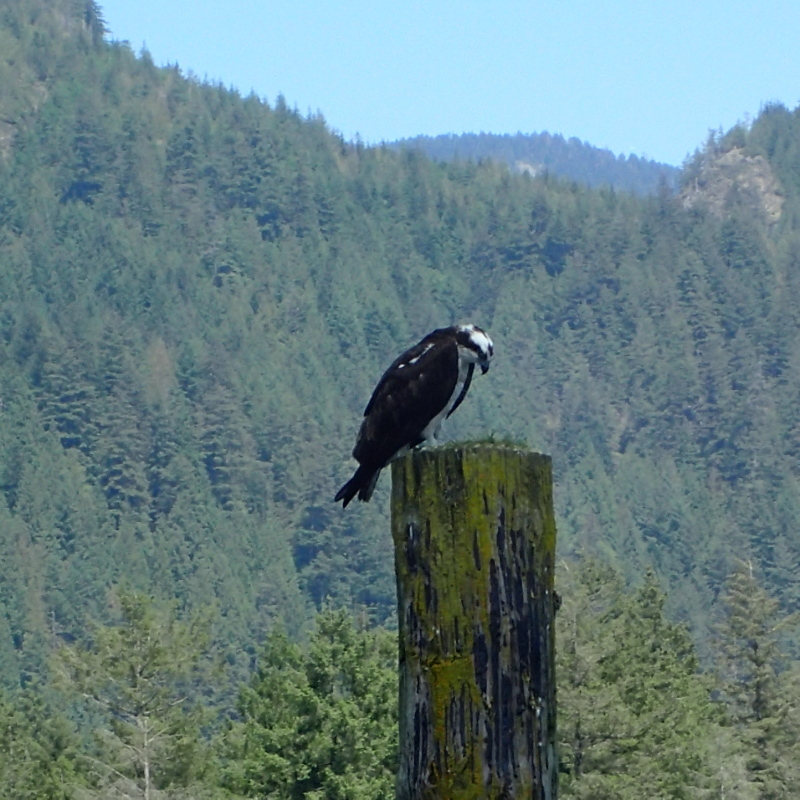 Minutes after leaving the shore, I spotted an actual Osprey. I got about half way along the deep water channel running along the dike when (as I’d hoped and planned) the afternoon inflow wind picked up enough to justify raising the Falcon Sail. The rest of the voyage was pretty much a free ride, with only the occasional brief paddle to clear a wind shadow. Just before 5PM, I arrived at Osprey Creek. 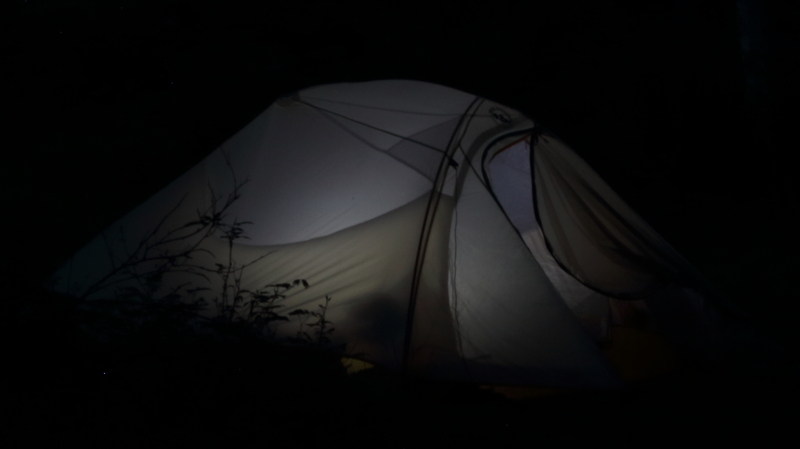 The south camping area was all tunnels beneath a dense thicket of trees, which promised to be dark and buggy. Plus, some power boaters had already set up camp there. They weren’t at home, but their spoor was plain: coolers too enormous even for canoes, bungalow-sized tents, and an inflatable pull-toy anchored just off shore. 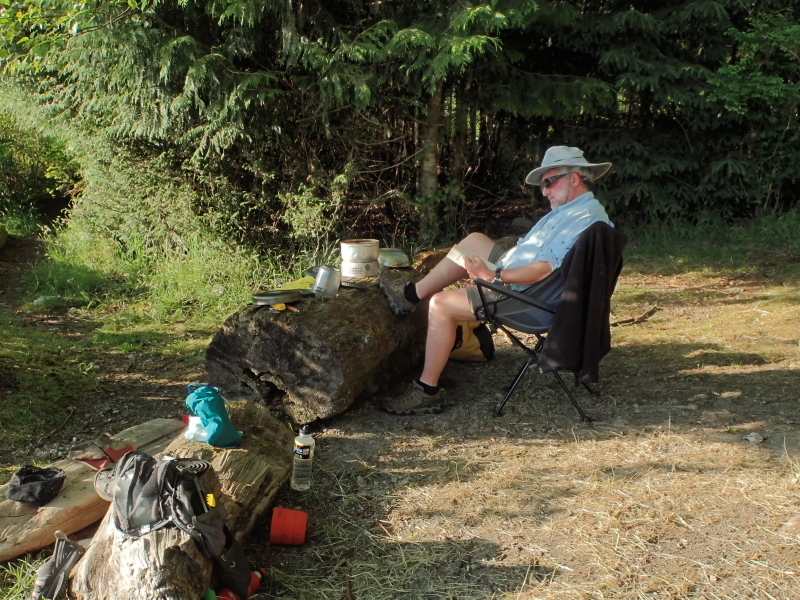 I carried on a few hundred meters to the north camping site. No sign of other campers, but a challenge of a different sort: with the lake at exceptionally high water levels, there were no beaches. Driftwood logs piled against the shore formed a very effective barricade. 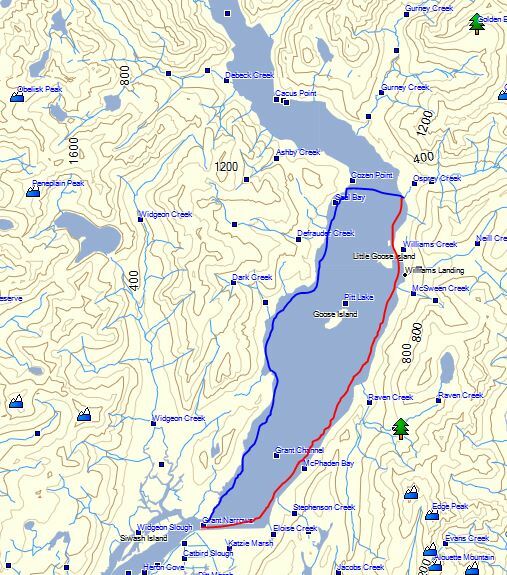 Fortunately I found one slightly offshore log to act as a breakwater while I dismounted, then pulled my kayak directly up and over the other logs and onto the upland. 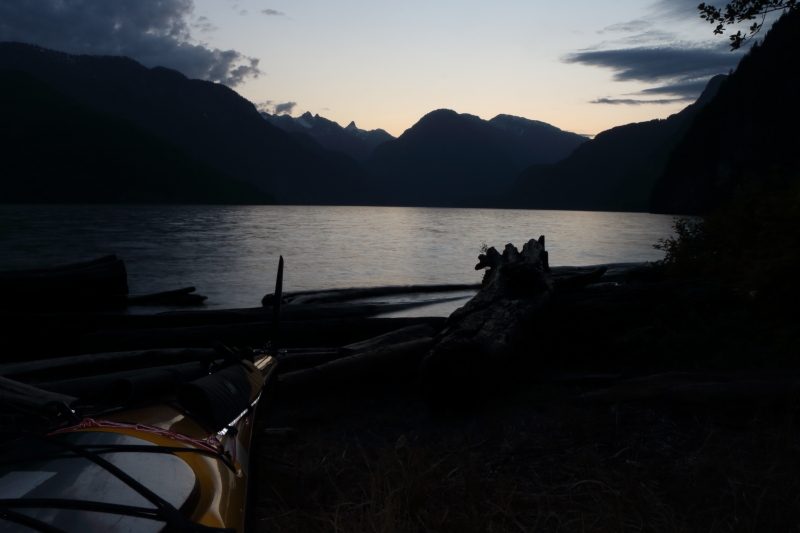 No portage shuttles of boat or cargo – I simply unpacked things directly from the kayak as needed. 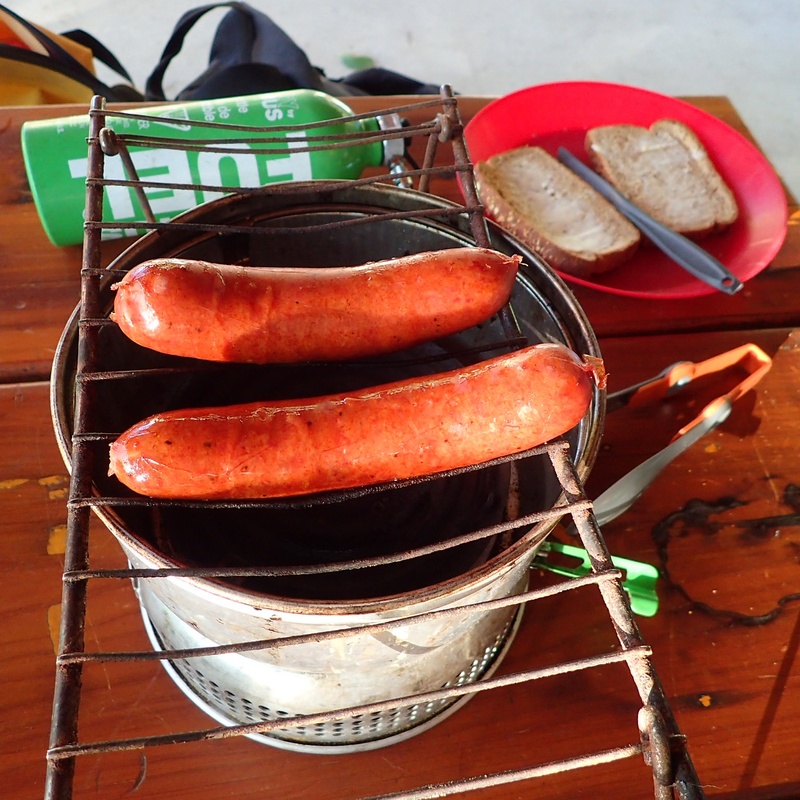 I had camp made and the Bavarian Smokies on my stove-top grill within a hour. 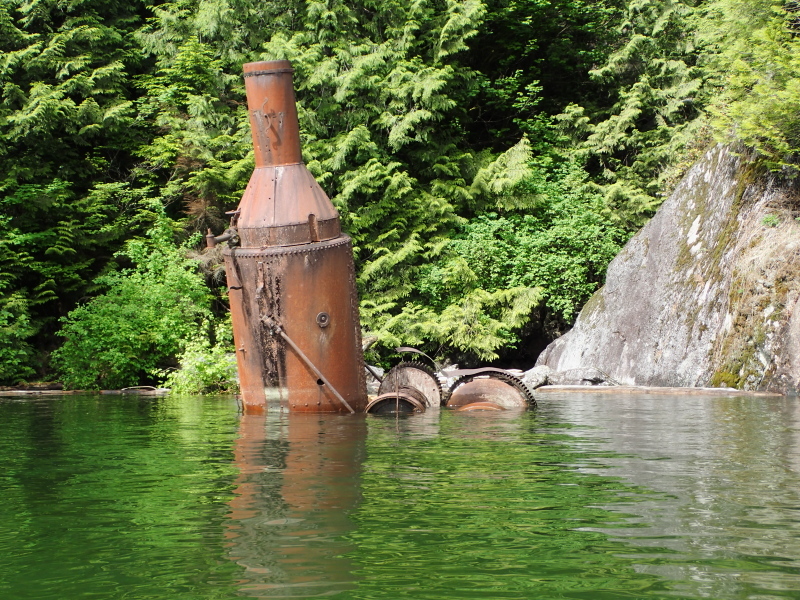 The only hardship was that the warmish waters of the lake had made my beer merely vaguely cool instead of crisply cold. The horror, the horror! The only bit of physical work I did today was wading chest deep into the lake to pivot an incoming driftwood log that would otherwise have blocked my launch next morning. The dip in the water was quite refreshing. On the water about 10AM, launching into a cool and cloudy morning. 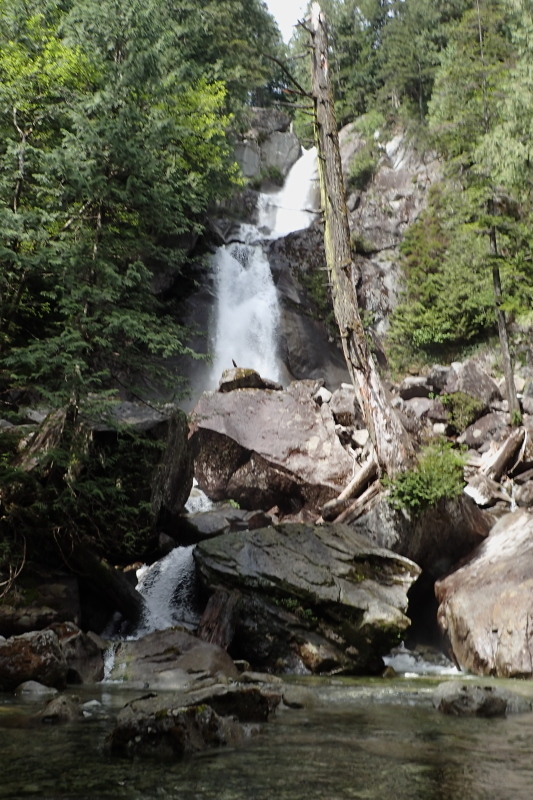 I crossed the lake to Cozen Point, finding, as I hoped to, several petroglyphs and the spectacular falls at Defrauder Creek. High water made landing to use my DSLR camera impossible at the falls, so I paddled up into the lee of a log and shot with my point and shoot. And as a bonus I discovered what I assume to be a donkey engine leftover from a logging operation. 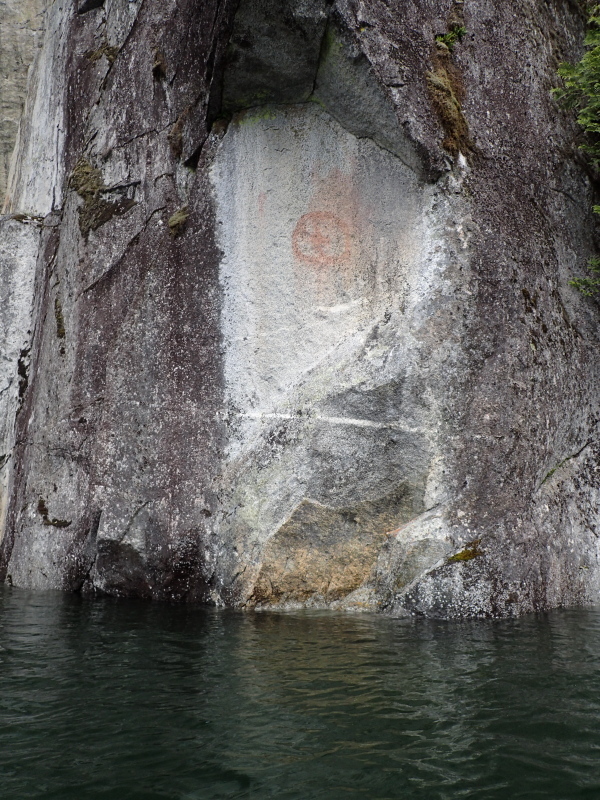 No free ride today – after over four hours of honest paddling, I landed just after 2:30PM at the take-out. And I was home on time to BBQ dinner for the family. 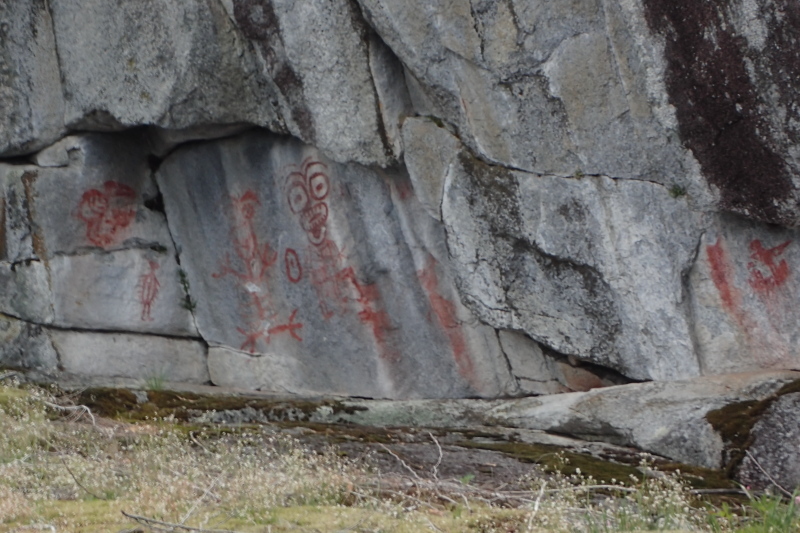 It’s so cool that we have such a semi-wilderness trip opportunity right on Vancouver’s doorstep. My route. Outbound in red, return in blue. 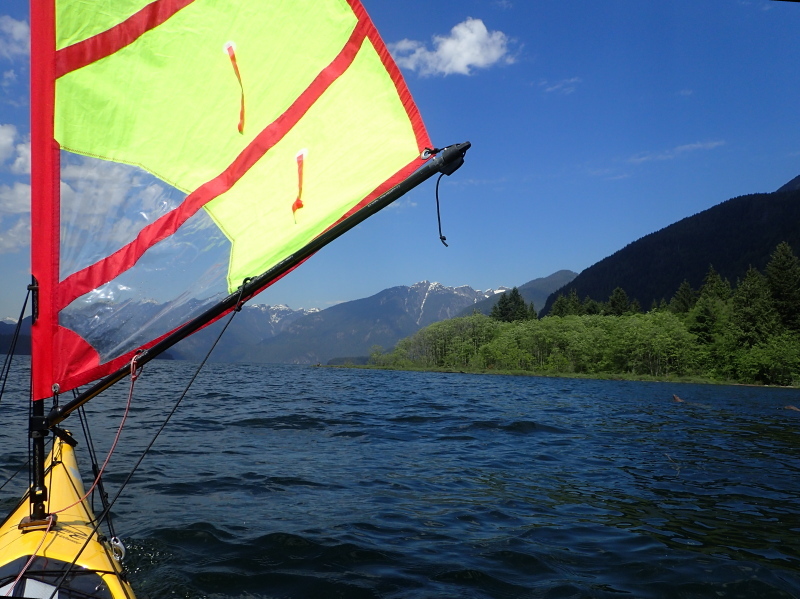 This entry was posted in camp cooking, Camping, Falcon kayak sails, Falcon Sail, kayak camping, kayak sail, Kayak Sailing, kayak touring, Pitt Lake, sea kayak, sea kayak sailing, Sea Kayaking, Tents and tagged British Columbia, Camping, Kayaking, Pacific Northwest, Pitt Lake by Philip Torrens. Bookmark the permalink.